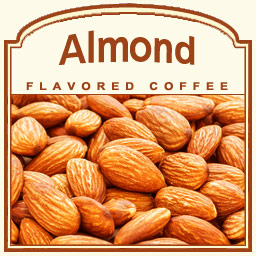 Our Almond Flavored Coffee is a smooth blend of 100% Arabica coffee combined with the rich flavor of toasted almonds. Inspired from several desserts of the Middle East, such as almond biscotti and amaretto, each cup is enhanced with sweet almond essence and roasted to energize and prepare you for any Monday morning. Also enjoy this particular flavor with your favorite dessert or finish a meal with this delicious, hot cup of gourmet flavored coffee. The rich, buttery flavor and invigorating, toasted almond scent will make any morning complete, as well as allowing any almond enthusiast to relish in a slightly modest, guilty pleasure. If you�re looking for a high-quality, stimulating blend of coffee and almonds, this flavored coffee should be your number one choice.